EA Sport's FIFA 14 video game adds big name players and stadiums. 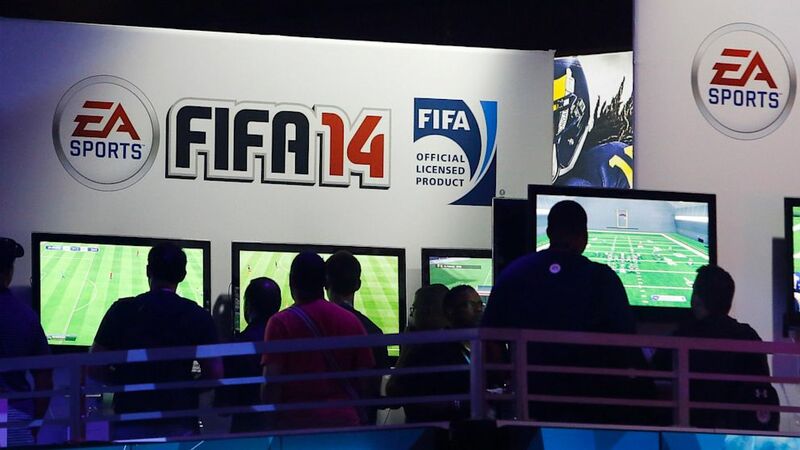 camera (Patrick T. Fallon/Bloomberg via Getty Images) Attendees try out Electronic Arts Inc.'s FIFA 14 and Madden NFL 25 video games at the company's booth during the E3 Electronic Entertainment Expo in Los Angeles, California, U.S., on Wednesday, June 12, 2013. E3, a trade show for computer and video games, draws professionals to experience the future of interactive entertainment as well as to see new technologies and never-before-seen products. Twenty years ago, EA Sports created its first soccer game, FIFA International Sports. A small team of programmers at EA Canada worked 16-hour days, eating spaghetti made in a kitchen downstairs from the studio, to put it out in 1994. Because an initial agreement for the rights to the FIFA name didn't include any player names or likenesses, several of the staff inserted themselves and family members into fictitious lineups. A full-length story on MCVUK.com tells the complete story. In two decades the game has become EA Sports' best seller. The next edition, FIFA 14, hits North American stores on Sept 24. Unlike the inaugural game, it will include licenses for 30 leagues, 600 teams, and over 16,000 players. A trailer for the game shows the meticulous detail co-opted from real life: colored nets behind goals, Daniel Sturridge's rolling-arm celebration, the two lines shaved into the base of Stephen El Shaarawy's mohawk, and Christian Abbiati flailing at a shot – especially poignant given his error against PSV Eindhoven on Tuesday. The Argentinean Primera División will also feature, for the first time, in Pro Evolution Soccer, FIFA's main competitor. PES 14 comes out in North America on the same day, Sept. 14. Here's a trailer for that game. The Konami title, formerly called Winning Eleven, lacks the extensive player rights of EA Sports. The current edition features Cristiano Ronaldo on the cover. Also coming later this year, though without a specific release date, is Football Manager 14, an immersive general-manager style game. Instead of controlling players on the pitch, the user adjusts training regimens, fiddles with tactics and makes trades. Just think: 20 years ago playing soccer inside meant broken lamps and maternal lectures.